“He is part of a new generation of teenagers who are beginning to drink younger, say social workers concerned about a trend they started noticing about four years ago” (Social Workers Sounds Alert on Young Drinkers, Danson Cheong). If a case is made about “a new generation of teenagers who are beginning to drink younger” (ST, Mar. 1) in Singapore one would expect convincing evidence to be presented, yet the report in The Sunday Times was instead anchored by a loose collection of opinions and anecdotes, as well as presuppositions of this perceived phenomenon. 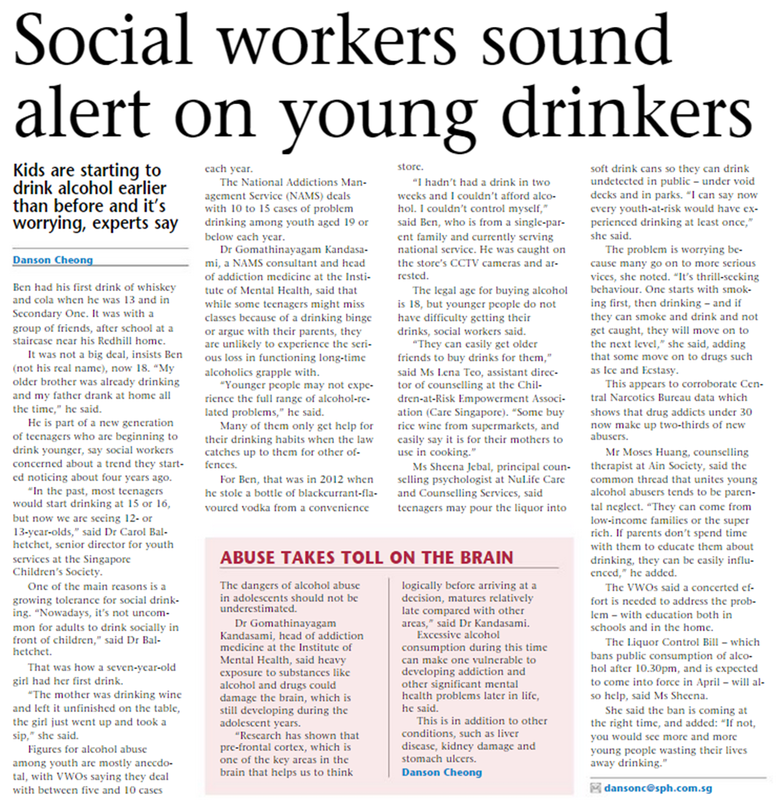 Experts, these social workers may be, but where were the supporting numbers for their arguments? In other words if it is argued that there are more teenage drinkers or if they are starting at an earlier age, then the hypothesis could for instance be corroborated with a longitudinal study within a defined time period, or notwithstanding self-response biases questionnaires completed by young Singaporeans. Even the figures cited – of the National Addictions Management Service dealing with 10 to 15 cases of problem drinking among youth each year or the somewhat tangential information from Central Narcotics Bureau that drug addicts under 30 now made up two-thirds of new abusers – hardly prove any of the aforementioned, anecdotal observations. Furthermore the concluding reference to the Liquor Control Bill, with the suggestion that the ban of the public consumption of alcohol after 10.30pm “is coming at the right time, [because otherwise one] would see more and more young people wasting their lives away drinking”, is not only abrupt, but inconsistent. If it has been posited by other social workers in the same report that under-aged teenagers have no trouble obtaining alcohol, then the ban will hardly achieve the intended impact, and might even spur more to test these boundaries. In the absence of statistical evidence these slippery slopes and generalisations – of the increased likelihood of alcohol abuse and the possibility of teenagers moving on to “drugs such as Ice and Ecstasy” – become even more apparent. These observations by the social workers may have been teased out with the best of intentions, though more systematic analysis of the problems faced by their beneficiaries will only enhance the effectiveness of their responsibilities. The suggestion for a more concerted effort to address the purported situation “with education both in schools and in the home” was reasonable, with greater emphasis on present perceptions. Only with a firm grasp of the status quo can strategies or policies be properly designed.